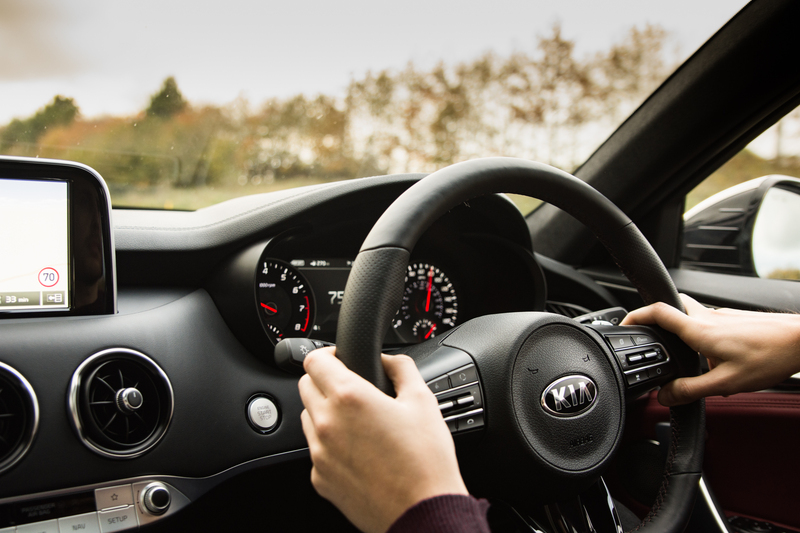 Has Kia's grand touring debut got what it takes to be a BMW beater? It’s a conspiracy. There’s clearly something in the drinking water over in South Korea, because just months after we were blown away by Hyundai’s first stab at a proper molten hatchback in the form of i30 N, sister company Kia has released a showstopper of its own. 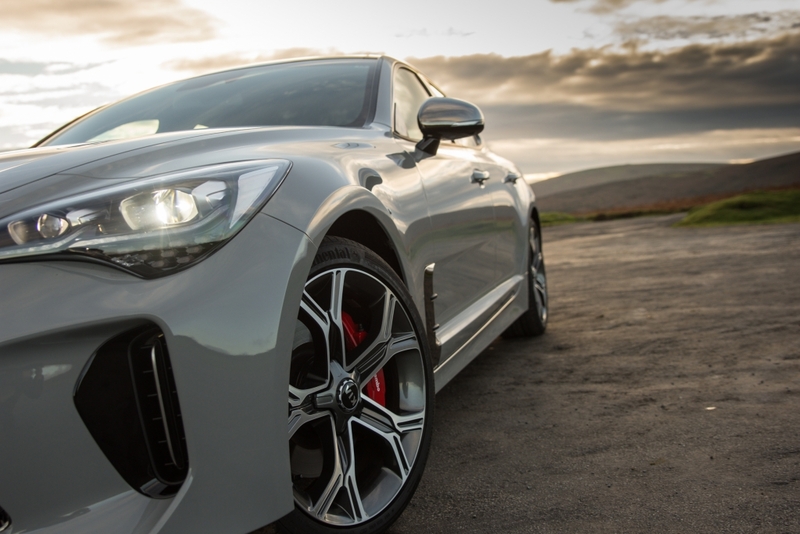 The Stinger GT S is six years in the making and a wild departure from Kia’s archetypal line of affordable hatchbacks and family-friendly SUVs, boasting curvaceous grand tourer styling and a 3.3-litre 365bhp twin-turbo V6 engine that makes some of its more everyday offerings look decidedly vanilla. Chief Design Officer Peter Schreyer and European Head of Design Gregory Guillaume, the chaps behind Stinger’s bold looks, have stayed true to the 2011 Kia GT Concept’s striking lines, while ex-BMW M-Division guru Albert Biermann found time in his busy Hyundai N schedule to apply some rear-wheel-drive erudition. All in all, Stinger looks like a recipe for success, boasting the sort of features and enticing price tag that could prize customers away from the established British and German giants. According to Guillaume, Stinger was inspired by the elegant grand tourers he gazed upon while growing up in 1970s France, which explains the elongated bonnet, lengthy rear overhangs and broad shoulders. The roofline gracefully rises from the steeply raked windscreen and tapers along to the boot, while Kia’s signature “tiger nose” grille is larger and more aggressive than those found on other Kia models, with the addition of large cooling intakes for the front brakes adding to its menacing demeanour. 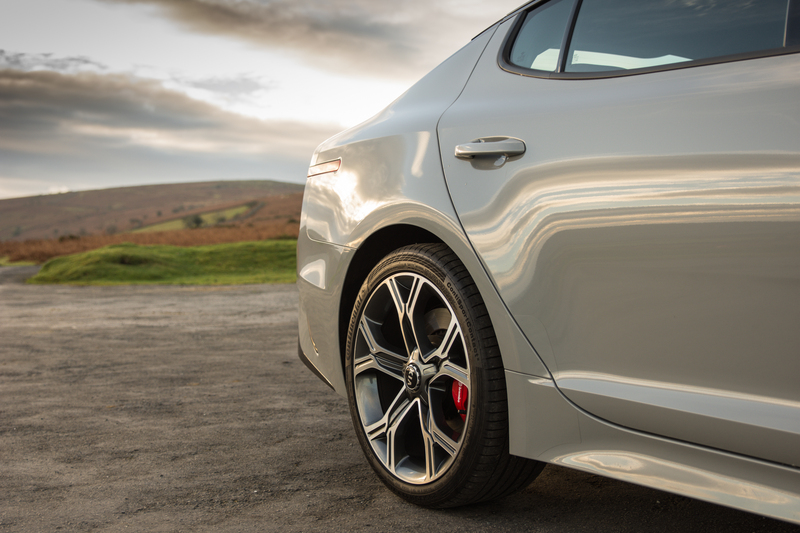 There is plenty of Jaguar in the overall proportions and a brief stop over in Starbucks on our test drive resulted in a ten-minute conversation with a very intrigued XE S owner, who had parked up next door and demanded a look inside. 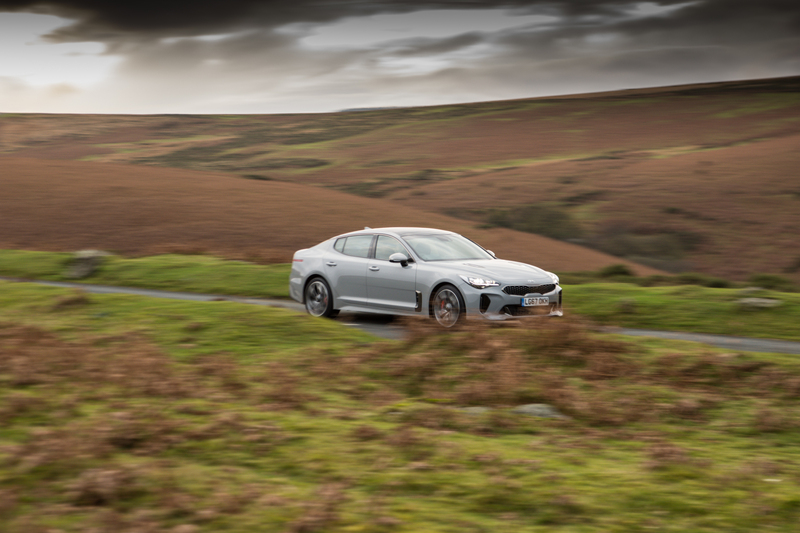 However, when we explained to our friendly Jag owner that Stinger GT S costs £40,495 with every conceivable optional extra thrown at it, we almost had to forcibly remove him from the driver’s seat. It’s a well-balanced exterior and one that will certainly leave many passers-by scratching their heads and wondering what on earth it actually is. 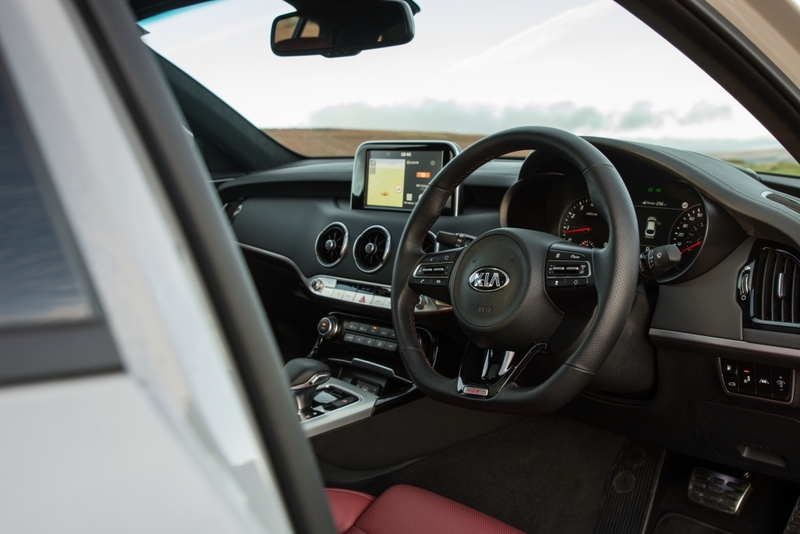 BMW, Mercedes-Benz and Jaguar have countless years experience in creating premium machines that are designed to obliterate motorway miles in sumptuous comfort, so it’s only understandable that Kia is going to struggle to compete in this department. Granted, Stinger GT S comes fitted with a centrally-mounted 8-inch touchscreen infotainment system, a 7-inch TFT instrument cluster and a customisable head-up display, while leather and aluminium touches grace most surfaces, but it doesn’t quite sing like the aforementioned German brands. Even Kia’s choice of font for the switchgear and infotainment system feels a bit run-of-the-mill, while the air vents and dash layout seem like a pic ‘n’ mix of rival cars, rather than something truly unique. That said, it’s an impressive suite of kit given the price tag, with everything from autonomous emergency braking to lane keep assist, automatic headlights to cross traffic alert and blind spot assist thrown in to the mix. The infotainment system is also fully loaded with all the mod cons, with Apple CarPlay and Android Auto connectivity, European mapping from TomTom and online services, such as live traffic and weather reports, beamed to the screen. There’s loads of space inside, too. And while the Stinger is pitched at BMW’s 4-Series and Audi’s A4, it actually sits somewhere between these models and the class above. The result is large, sumptuous rear seats, with plenty of head and legroom on offer, plus a boot that will happily swallow golf clubs, large suitcases and other bulky accoutrements of the affluent. 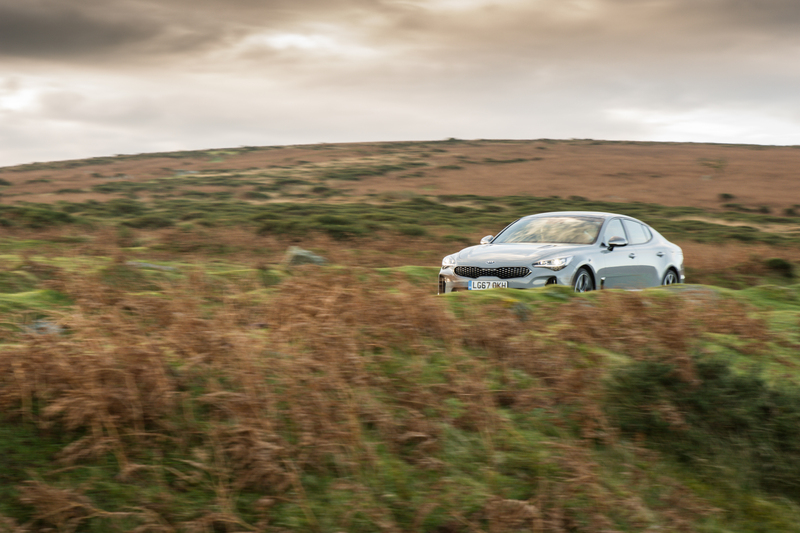 It’s an excellent ruse to cover up the fact that Stinger’s chassis isn’t quite as poised as those offered by BMW, nor is the ride as pillowy as a Mercedes-Benz, but it does strike an excellent balance between straight-line performance and cruisy comfort. 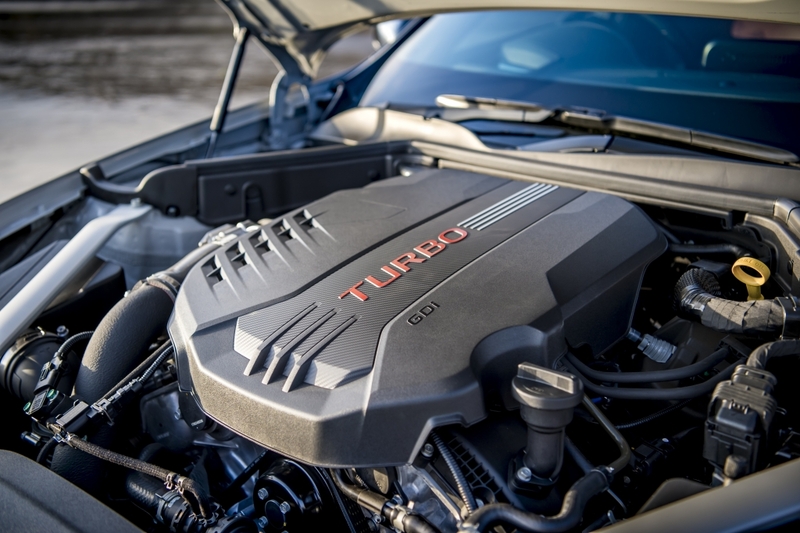 The big V6 offers plenty of power, with a thumping 510Nm of torque delivered at 6,000rpm that results in an impressive 0-60mph sprint time of 4.7 seconds and a top speed of 168mph. 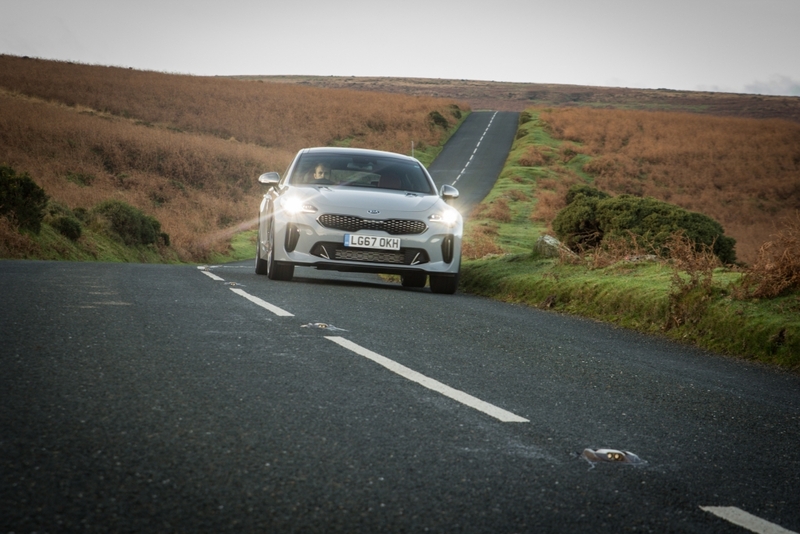 In fact, Kia decided to show off the straight-line performance by ragging three models up and down the runway at Newquay airport. Suffice to say, they easily tickled the 150mph mark before deploying anchors. All versions have fully independent suspension via MacPherson struts at the front and a five-link set-up featuring double wishbones at the rear, but GT S introduces adaptive Dynamic Stability Damping Control (DSDC), which can be changed through the Drive Mode Selector. This small dial in the centre console adds weight to the steering and firms up the suspension in ‘Sport’ mode, while more rorty exhaust note appears to be piped into the cabin. It also bins off the traction control, freeing up the rear wheels for a spot of rubber-burning tomfoolery if the mood takes. 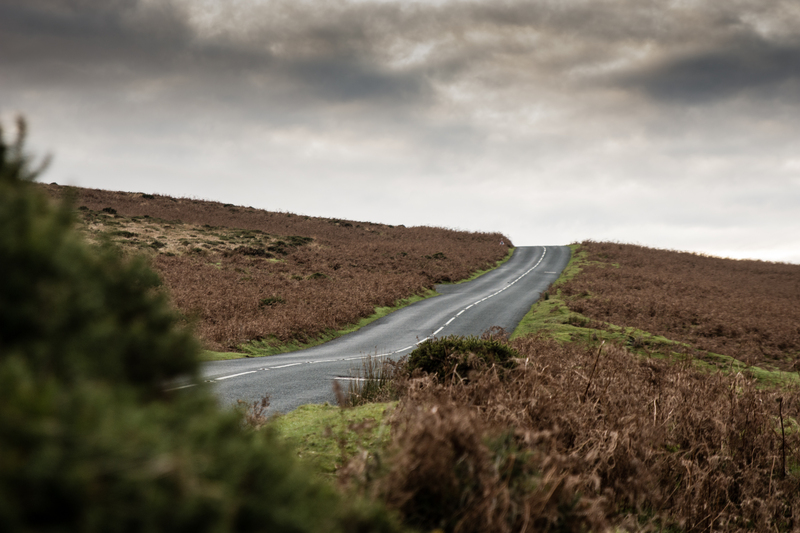 Unfortunately, crushingly slow speed limits, tractors and other bimbling traffic blighted much of the undulating Devonshire test route, so we can’t really comment on its dynamic abilities but Biermann claims it has covered more than 480 laps Nurburgring Nordschleife and who are we to argue? But really, this is a vehicle that is going to pound the motorways of the UK and Europe, and it is very adept at doing so. The massive 19-inch wheels mean the cabin can be a little noisy on rough surfaces and the fuel consumption in this model requires a healthy bank balance but it is otherwise comfortable and more importantly, it is quick. The Korean marque knows it will have a tough time getting the right sort of customers in Stinger GT S, which is why it has very modest sales predictions here in the UK. 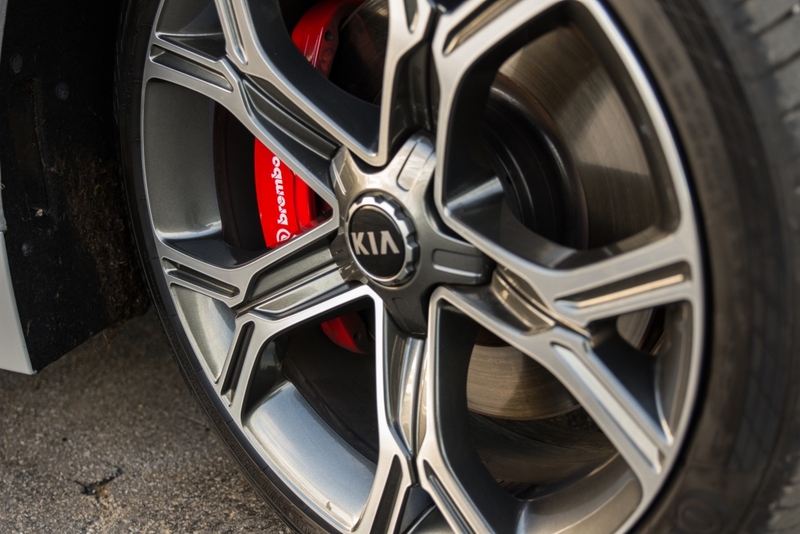 “We know it will be for that private buyer who wants something different,” one Kia spokesperson revealed at the vehicle’s launch and that succinctly sums up Stinger. It’s arguably not as opulent inside as its German rivals, nor does it feel like it could best a BMW on a demanding handling circuit, but who really cares about that sort of thing? Instead, it offers all the interior gadgetry a buyer could ever want, some eye-catching exterior styling and the same seven-year/100,000-mile warranty as any of the company’s other models. 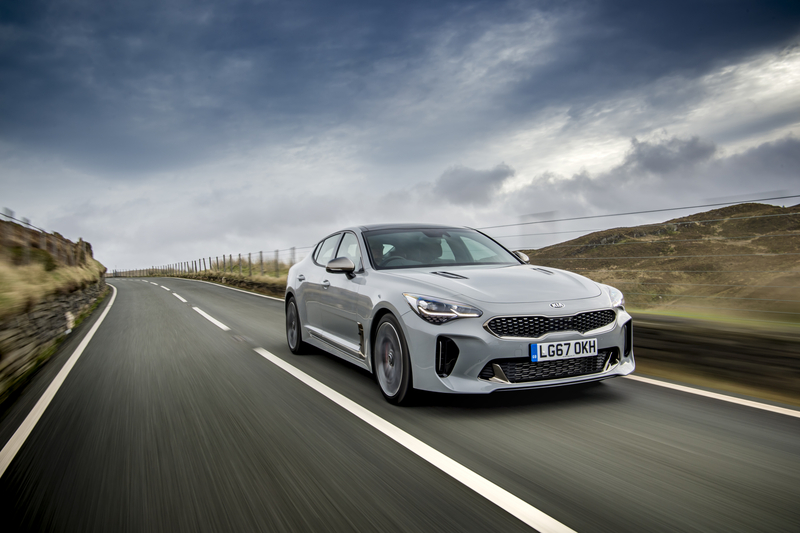 Maybe it’s too early to say whether Kia should be popping the champagne corks in celebration but Stinger GT S is an impressive debut and it already has a fan in one latte-sipping Jaguar owner.